The weeks during surgery preparations are not easy for anyone, but the stress rises to a new level when the patient is a child. Luckily, digitalisation will smoothen healthcare procedures before hospital admission — and this is what Buddy Healthcare's solution is for. 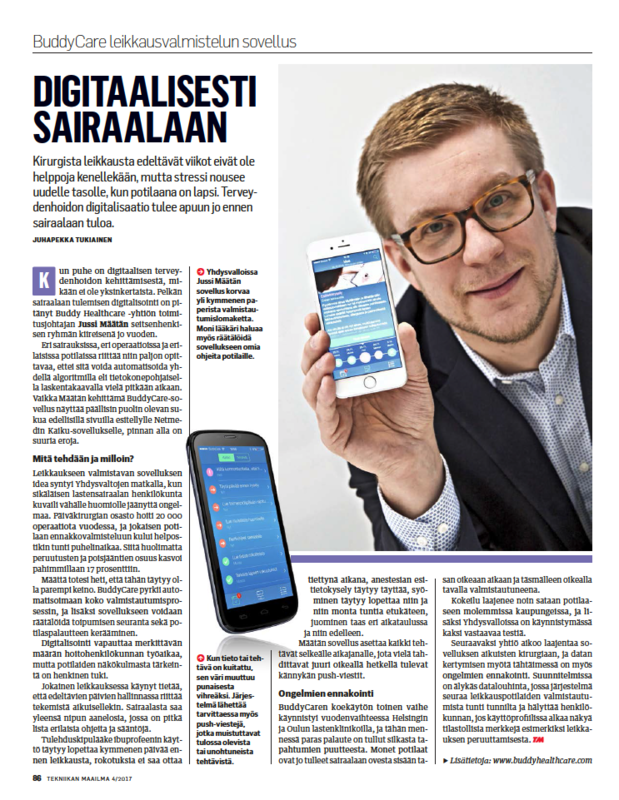 Tekniikan Maailma tested BuddyCare surgery app. For example, one of the consequences of adopting such solutions is that, in the US, using our app can help get rid of a huge amount of patient assessment paperwork. Many doctors would like to also tailor the application settings for individual patients — and this is what digital communication solutions are capable of also. This is, in short, what Tekniikan Maailma (4/2017) covered about Buddy Healthcare. You can read it in Finnish in the printed magazine, with subscription on the website or downloading PDF copy by clicking the screenshot on the right. Tekniikan Maailma is one of the leading automobile magazines in published in Helsinki, Finland, and the biggest all around technology magazine in Scandinavia.